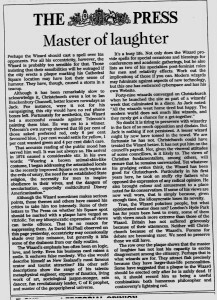 A summary of progress from 1972 up to the present time, by the Wizard of New Zealand (formerly Ian Brackenbury Channell). 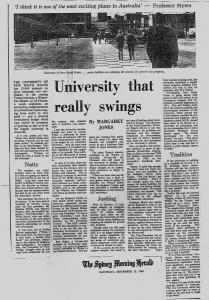 Graduating in 1963 from the University of Leeds with a double honours degree in Psychology and Sociology, I was brought from the UK to Australia that same year as a lecturer in adult education responsible for the Community Arts programme of the University of Western Australia. 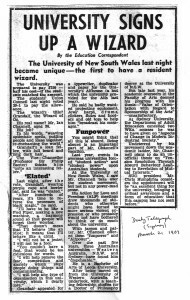 In 1967 I joined the staff of the School of Sociology at the University of NSW in Sydney where I undertook a PhD thesis in the Sociology of Art. During the previous years I had prepared myself for this radical change in identity by allowing all government documents identifying me as a real (legal) person to lapse. 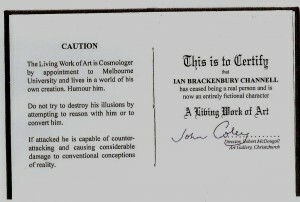 As far as the government was concerned Ian Brackenbury Channell had disappeared. I still have no documents identifying me as that person and my dramatic successful avoidance of the NZ Census on three occasions are good examples of the creative power of a living work of art. 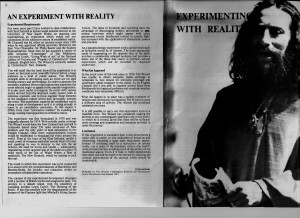 I moved to New Zealand in 1974 to prepare for an “imagination experiment” to test out the validity of my Post Modern Cosmology. 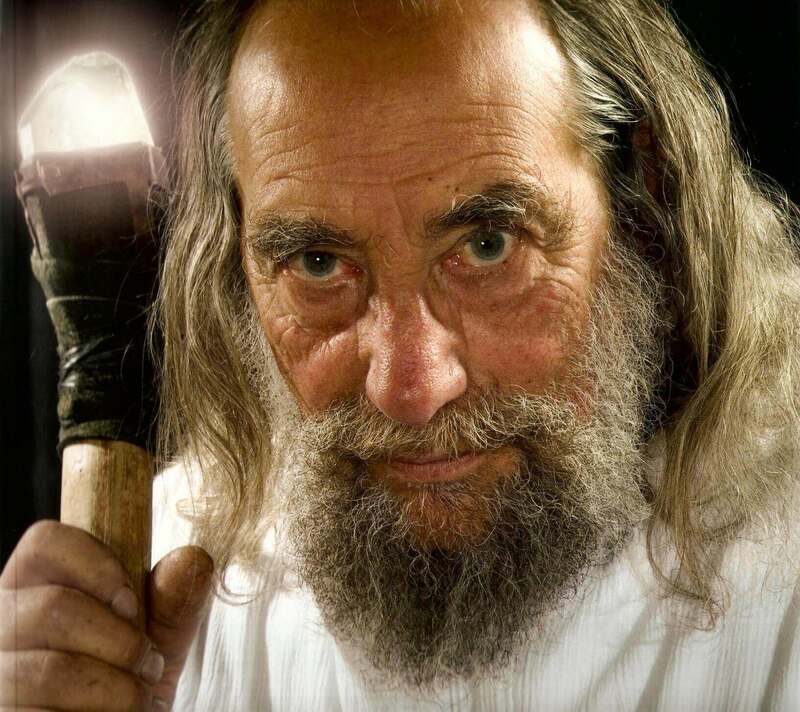 (8) Whilst seeking the necessary support I set about establishing myself as an exhibitionist/street performer outside the Cathedral in the centre of the city. 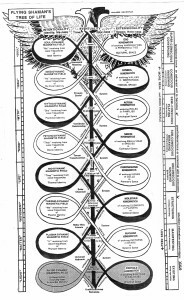 I also introduced my new cosmology in a course sponsored by the Christchurch Polytechnic. 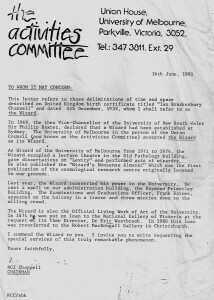 Unfortunately the Christchurch City Council chose to ignore my letters of recommendation from Melbourne, threatened to arrest me if I spoke in Cathedral Square and refused even to discuss my offers to serve the city as unpaid wizard, cosmologer and living work of art. (9) After issuing an ultimatum I declared aesthetic war on the council (10). 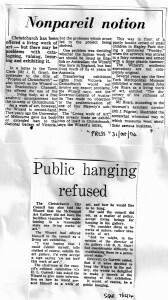 Through my skills as a popular performer and orator and using the fun revolutionary tactics that had worked so well in the universities I was able to make it impossible for the council to prohibit me from performing in Cathedral Square and soon became a well known tourist attraction, appearing in all the guide books. 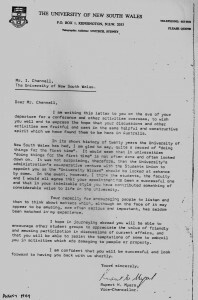 In 1989 received the Newman Award for tourism. The matter of the ambivalent relationship between conceptual art works and art galleries still remains. 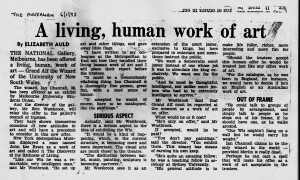 With the exception of Mark Stocker, Associate Professor in Art History at Otago University and Edward Lucie-Smith, author of “Artoday”, no art critic has shown any interest in the living work of art project. 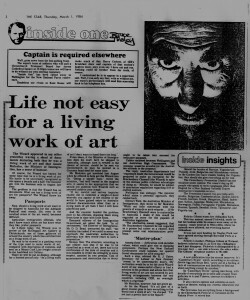 (16) Other conceptual artists seem happy to display their art works in galleries, receive government grants, and to become famous as ‘artists’. 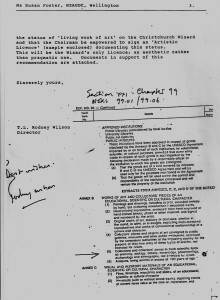 This seems to me to be completely opposed to the original raison d’etre of conceptual art. 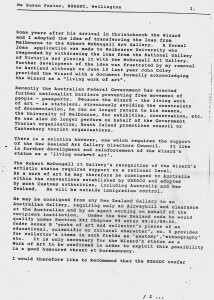 In 1995, as part of “Wizards’ Week”, celebrating 21 years of exhibiting myself in Christchurch, the City Council under the leadership of the Mayor, Vicki Buck, agreed to back an exhibition in the McDougall Gallery. This was curated by my fiancée Alice Flett, who has degrees in Classics and Art History from Melbourne University. 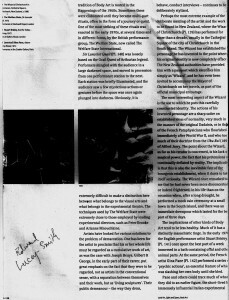 Alice has been curator of the ‘work in progress’ of the living work of art since 1972. 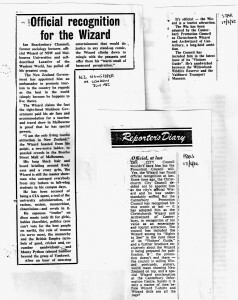 The exhibition took the form of newspaper and magazine articles recording the impressions created by the exhibitionist together with a polyptich of the Wizard’s life. 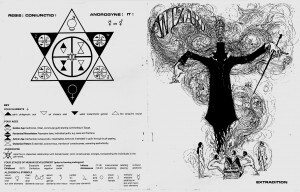 It opened with the Wizard hatching from a large egg whilst being blessed by other wizard colleagues and attended by a group of midwives which included the heavily pregnant Mayor, a previous Prime Minister, the previous gallery Director, and an art critic. 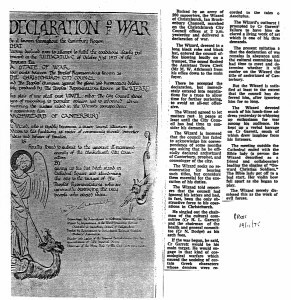 The catalogue took the form of a newspaper with two issues. 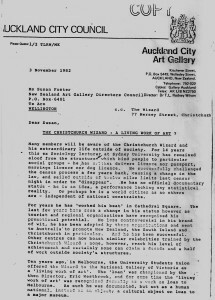 (17) Unfortunately there was a change of gallery directors at this particular time and the exhibition was poorly supervised and promoted and ran for only a few days. We were disappointed that so little enthusiasm was shown after all the years of effort. I have continued my summer performances in Cathedral Square and my reputation has been growing on the Internet, however little progress has been made over the past few years partly owing to changes in family circumstances, an arson attack on our home, which destroyed many of our possessions and the general lack of interest increasingly shown by national and tourist authorities, the City Council and the City Art Gallery. In 2009 I was greatly encouraged by being awarded the Queen’s Service Medal by the new National Government. This should help to dispel the belief in these institutions that my activities are undesirable and should not be supported. 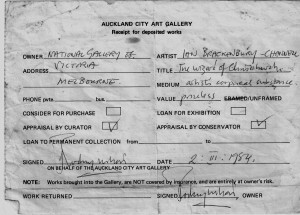 My grass roots popularity in New Zealand and my reputation overseas would make any properly funded and organised exhibition of the Living Work of Art a major draw card.